Island Lake Lodge’s culinary rep and posh digs are matched only by its skiing. Basketball has never interested me. I grant the athleticism involved, and if I were more informed, I might appreciate the technical aspects of strategy and positioning. But mostly I leave the sound of squeaky sneakers on hardwood floors to people like John to enjoy. The dying days of March found John far from his Kentucky home, watching a college basketball game on a tiny television set in B.C.’s Lizard Range. Bear Lodge on the shores of Island Lake is nothing like a sports bar, but it was the best John could do, being a 20-minute snowcat ride from the nearest road. I had just met John, but I knew two things about him. He loved bourbon and really loved his University of Kentucky Wildcats. More, he had made it clear that if his men in blue could just drain enough baskets to put them in the final four of March Madness, there would be lots of draining of bourbon glasses by all around. Pulling for a Wildcat victory was a good bonding experience for our group of 12. We had congregated from smaller units earlier that afternoon at Island Lake Lodge’s parking lot near Fernie. We had come from Kentucky, Massachusetts, Ontario and Alberta to get on one of their last cat-skiing tours of the year. Throwing a group of 12 people, most of whom have never met each other, into a space as small as the back of a snowcat generates instant social tedium. Naturally, the talk turned to conditions. The precipitation hitting the half-melted parking lot could only be called rain. But a guide who had come down on the outgoing cat had promised fresh snow above. Great stuff, he said, like cream cheese. I know of two kinds of cream cheese. One comes as a brick and is good for cheesecakes. I was hoping he had in mind the fluffier style whipped with air by a deli. It wasn’t a classic descriptor of good snow, but he seemed enthusiastic. The drops had turned to wet flakes by the time the cat’s tracks stilled outside Island Lake’s main Tamarack Lodge, one of four spacious log cabins. A cheeky No Vacancy sign was etched permanently in wood. Two-thirds of the spots each year are taken by returning clients, who have a 30-day priority booking period for the next year when their tour finishes. You don’t show up here hoping for an empty room. After not getting a key—no locked doors in this woody retreat—I stored my bags in the room, stuck around just long enough to warm my feet on the heated cedar floor and trudged over clumped cat tracks to the basement bar in adjacent Bear Lodge to saddle up beside my new friend John. That’s how I became a brief follower of college ball’s annual spring tournament, but I was soon more taken by the March Madness happening outside the window. “Convective squalls” was the term a guide had given to the turbulent weather. Short bursts of snow were rising and falling a few times each hour. With an ignorance and interest in snow science being the only two things our group had in common (I suppose you could add a growing concern for the Wildcats), we resumed obsessing over the chances that tomorrow would see us doing what we came here to do: enjoy the best skiing of our lives. Southern-seasoned celebrations brought us back toward the television. John was acting as if his first child, due in a few weeks, had arrived early. Around went the bourbon. Not the Scotch, mind you, the most expensive shot of which cost $32. Island Lake is a place where, no matter how the snow treats you, you can always find a way to indulge. It wasn’t always this way. Bear Lodge is now largely a bar but it was once the only building in the valley. Downstairs were the skis, boots and one-piece ski suits, the main floor was where the eating and partying took place and upstairs the skiers slept in dorms. Not just any skiers, though. Island Lake, posh though it may now be, was once the rough-hewn home to the continent’s hardest-charging skiers. American extreme-skiing pioneer Scot Schmidt not only skied here, he owned part of it for about a decade starting in 1995. He and other compatriots like Seth Morrison, Glen Plake and the late snowboarder Craig Kelly made a playground of the surrounding peaks. With them came the first wave of filmmakers like Greg Stump and a stream of magazine scribes and shooters who announced a new era of skiing. 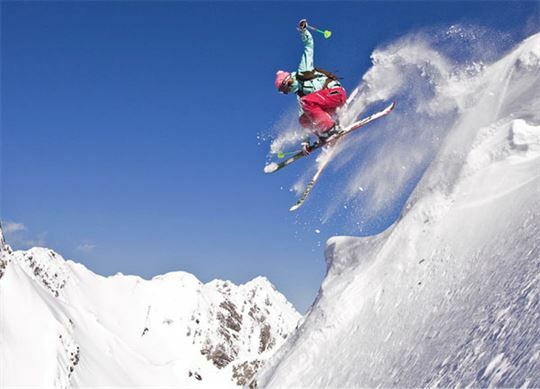 Skiing was growing up from the resort-based sissy schussing as seen in earlier Warren Miller films to today’s boundless, all-mountain dance with death. As much as anywhere else, Island Lake is where it happened. Over a dinner of things like terrines and compotes and reductions all complemented by suggestions from the in-house sommelier, I couldn’t help wondering where lay the true soul of Island Lake. Was it still a place where the planet’s best skiing could happen, or had the tender beef dinners, exfoliants in the spa and soft, so very soft, pillows on the king-sized, 500-thread-count beds taken a bit of the edge off it? Proving time came after the perfunctory avalanche rescue training session held outside the lodge the next morning. The graupel was coming down so hard on my hood I had a hard time hearing about what I needed to do to save the lives of my fellow skiers. As our tail-gunning guide, Brenda, pointed out, all those little graupel ball bearings would add a nice, fast surface to the 65 cm that had fallen over the previous three days. Looking down on the first run, it appeared to be slathered in the most delicious-looking whipped cream cheese I had ever seen. The only thing missing was several thousand tonnes of smoked salmon. It was not what you’d call weightless, blower powder. This snow had some heft to it. That might have been an issue had I been skiing on the 65mm-wide skis that Scot Schmidt had handled so effortlessly in those movies I had seen as a kid. I had double that width under each boot. And each millimetre was about to come into play. Having skied for 35 years, it’s not often I come across an unfamiliar sensation on-hill. But this seemed new. It was full-body skiing, throwing hard into wide GS turns with total confidence that the snow would be consistent, forgiving and substantial enough to pull out of one turn and into the next wide arc. Grouping up at the bottom, there was no trace of the social tedium from 15 hours earlier. We had something new to talk about, and now we were using more direct, even explicit language. At 73, John’s father-in-law, Irv, had decided to start high-grading his time on skis, skipping resorts to instead sample the cat and heli offerings around the West. “As I tell my wife,” he said, “I have to do it before I run out of time.” He’d eventually place Island Lake at the top of the half-dozen he had visited. His friend Jim, or “Killer,” as Irv called him, was 68 but had only been skiing for 23 years, which is a different matter than a 25-year-old who has been skiing as long. Irv’s son Chris was a retired professional cyclist with quads enough to keep his tele skis in line. He had counselled us that ice baths, not hot tubs, were better for recuperating muscles. He might have raced in pro tours, but I was prepared to ignore him all the way to the outdoor hot tub. There was also Kirsten from Edmonton. She and her brother, who she called “Chuckles,” were taking their dad, who she called “Mumbles,” on a 60th birthday trip. It was a harmonious family, with Kirsten smiling a lot, Chuckles goading Mumbles and Mumbles paying no attention. Run by run, Mumbles started showing his son a thing or two about chuckling. All told, the group included a doctor, nurse, diesel mechanic and lawyer. So we had all the important bases covered. For the next six hours, Brenda and lead guide Nick introduced us to the layout around the lodge. Surrounding the lake on three sides are 30 drop-off points where the cats can deposit skiers above bowls, chutes and lightly treed slopes. 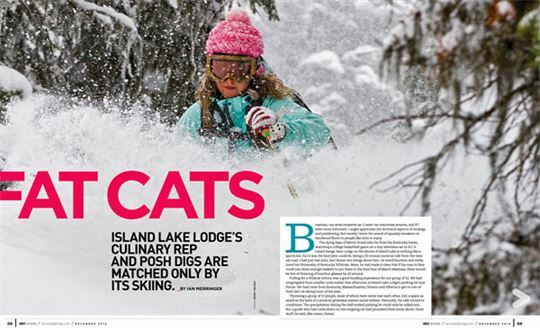 The terrain covers almost 30 square km and is usually home to three cats with 12 skiers each. Normally this would be called the tenure, but Island Lake is unique among the 40 or so cat and heli operators in B.C. in that they actually own the land, having bought it off Shell in 1995. While other operators often have more land to play on, with ownership comes privileges. Notably, Island Lake can keep snowmobile-touring poachers out, plus it gets to glade the terrain to its liking. 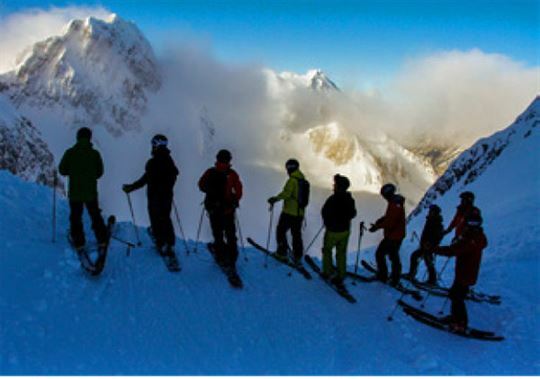 Two long-time guides do the glading, so it’s done to suit the needs of skiers, not sawmills. Runs often start out in the alpine and then descend into widely spaced trees before funneling slightly toward one of two-dozen cat pickup points. Those determined to ski alpine bowls without a tree in sight are probably better suited to heli-skiing. If, like me, you prefer to have trees to turn around, the simplicity and relaxed atmosphere that comes with ground-based transportation makes heli travel seem like a headache. In two days we only waited at the bottom for the cat once, and got at least a dozen 700- to 1,000-vertical-foot runs in both days. With the avalanche hazard being high, on account of the metre (rounding up) of new snow, we spent more time in the trees, though Brenda assured us that the area sees enough traffic over the season for the slopes to be stabilized by skier traffic. She claimed to have never used the avalanche beacons except in training, and told us that the main source of injury on these hills was when skiers majestically collided with others in the group. This might have been on Bhavlene’s mind when she pulled up and ditched herself halfway down a run toward the end of the day. Being the last one down, she wanted to point out that it was not all her fault. She had thrown herself into the snow, she said, because while coming across the hill, she was frightened to hear a screaming skier bearing down on her from above. “No,” I told her sheepishly. “Nothing wrong. Not a thing, in fact. That’s why I was screaming.” I’m not the type to exercise my vocal cords just for the hell of it. Sometimes the moment just moves you. 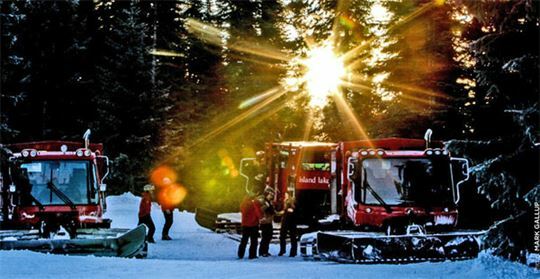 That afternoon during après ski in Bear Lodge, we viewed a slide show taken of us by past part-owner Mark Gallup, probably the pre-eminent photographer from Island Lake’s media heyday. Truth be told, on our late-season visit, we didn’t measure up to what I remember seeing on magazine pages from a dozen years earlier. At least on this day, Island Lake wasn’t home to the best skiing on the planet, just the best skiing I’d ever done. Later that week, the Wildcats lost the championship game. If John was still feeling as high as I was, I like to think he took the news in stride.